Firstly, I have no connection with Wills Wing other than as a user of some of their products. Secondly, this article must be read in conjunction with the U-2 manual, freely downloadable from the Wills Wing web site. Americans and most continental Europeans do not rig flat. 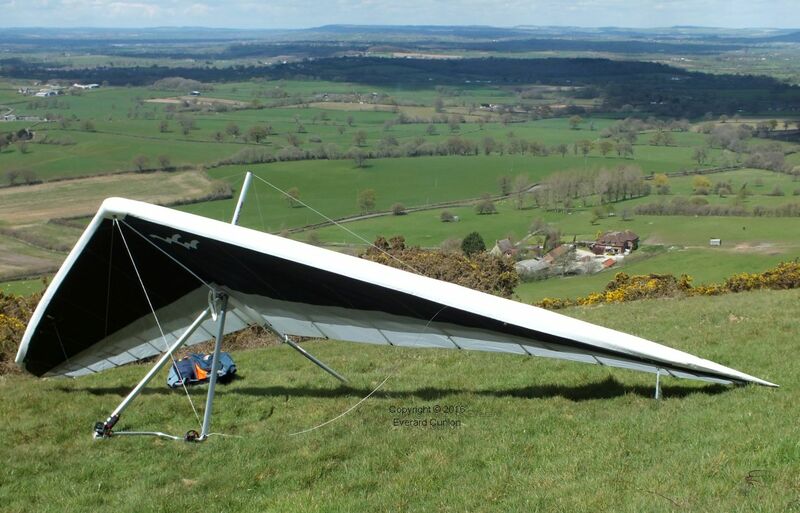 However, on the bare hills of Britain, where often there is no shelter from the wind effective enough to let you rig the wing standing on the control frame, you have to rig flat. 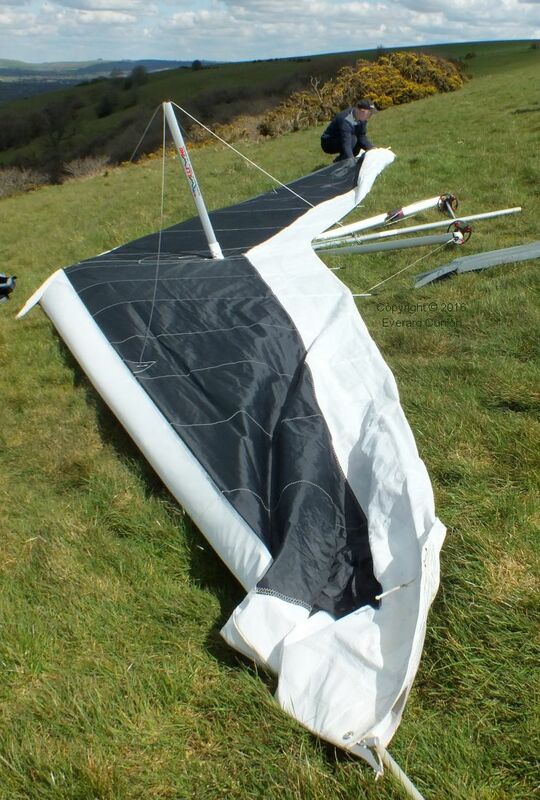 The problem is that, with the wing standing on the control frame, even when the glider is turned sideways on to the wind, you cannot overcome the pressure of the wind bearing down on the sail when you try to attach the haul back. That is the case for low tension single surface wings as much as for highly tensioned performance gliders. Unzip the bag and rig the control frame, then flip the glider over. 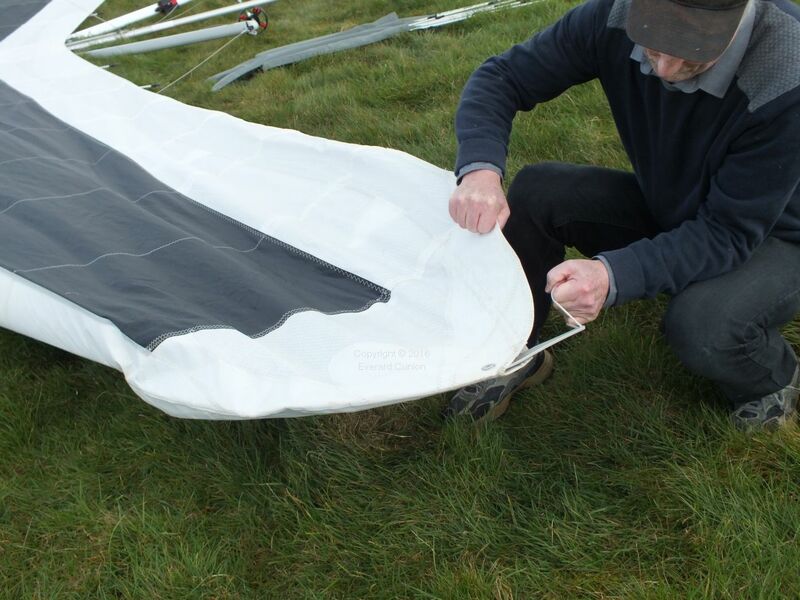 Undo the sail ties and partially spread the wings, keeping the leading edge close to the ground so as to prevent distorting the nose plates. 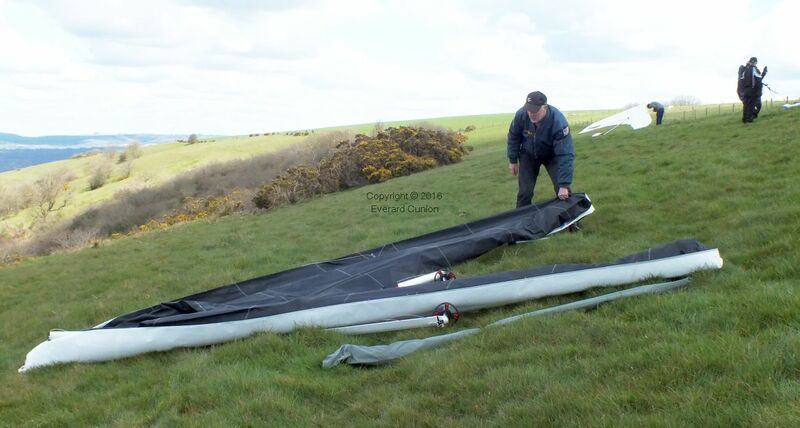 This stage shows the disadvantage of rigging flat: The sail gets dirty if you are not careful and, in rocky conditions, you must take extra care to prevent rocks from damaging the sail or the leading edge tubes. Notice the absence of tip bags. The tip bags of the U-2 are a struggle to get on and, when rigging flat, they provide no advantage, so I omit them. Insert the innermost three battens each side, but do not tension them. That is (in Wills Wing speak) do not engage the rear tips in the trailing edge at this time. Incidentally, how do you remember the rigging procedure? It is an important question because getting things in the wrong order, particularly when de-rigging, can get you in a stuck situation and can even damage the sail. My previous wing, an Airborne 154 Sting 3, although slightly simpler to rig, was even more sensitive to the correct order of rigging. The solution is not to have to remember it. I have a short check list written on a piece of paper stuck to the keel tube with clear sticky-back plastic. Tension the sail by hauling back the haul-back and attaching it. The king-post rises up part way because a short cord connects the haul-back cable to the aft top cable. In the photo, you should be able to discern that the leading edge of the sail is more tensioned than previously. Bear in mind that the few battens in the sail at this stage are not tensioned. Attach the rear top wire, then grab a tip wand from the batten quiver, go to the tip, and lay the tip wand on the ground. Insert the tip wand into the socket in the end of the leading edge tube. This necessitates some scrunching of the fabric at the leading edge, but no matter. I do it by feel. Do not attempt to attach the over-centre lever at this stage. Then do likewise at the opposite tip. When it reaches the end, the cup rotates and clips itself onto the end of the wand with a clunk! Usually. Sometimes it slips off above or below the fiberglass wand and sometimes the hinge rotates. It can be frustrating. Give it an extra push to make sure it is fully on and secure. Then do the same at the other tip. 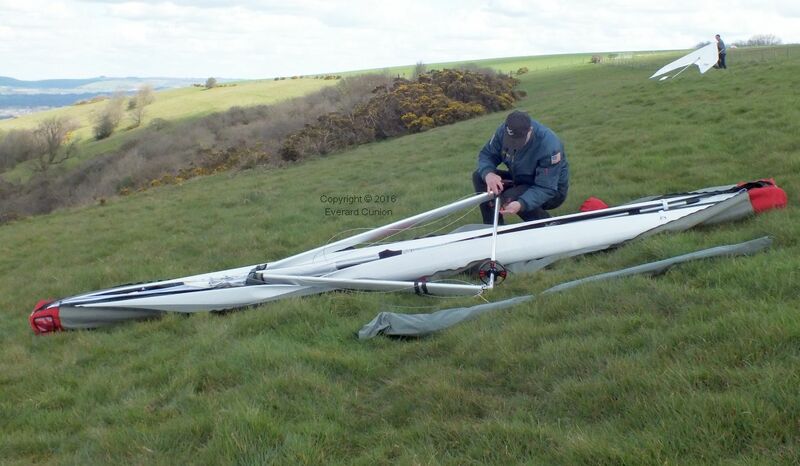 Rigging a hang glider is hard work! With both tip wands secured and partly tensioned, tension each one fully with its over-centre lever. Another satisfying clunk! Insert the remaining main battens and tension them all – including the inboard three each side that you inserted earlier. In very strong winds (but why are you flying in very strong winds?) 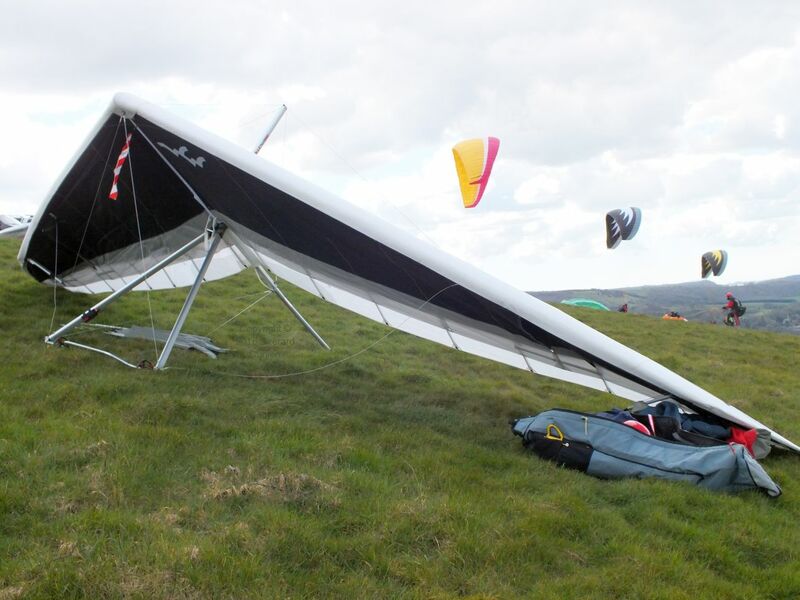 or if you just prefer to complete the rigging process as far as possible with the glider flat on the ground, omit this section and proceed to Rigging the underside. 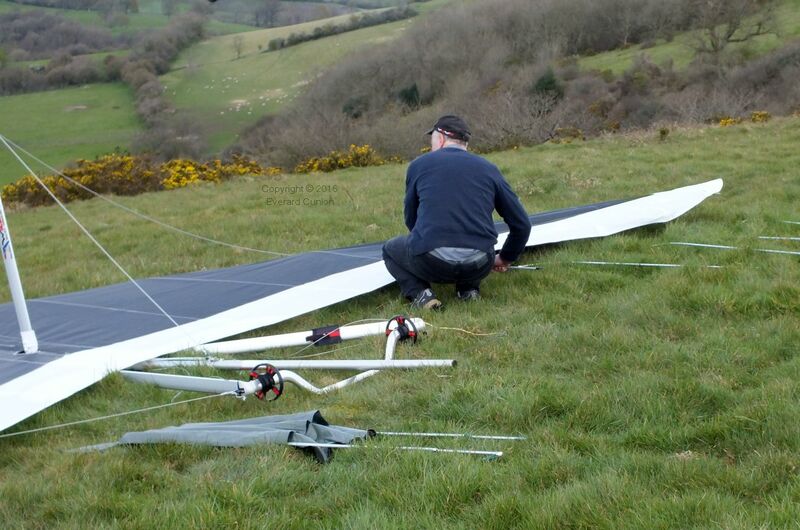 Grasp the keel tube and raise the nose to let the wind lift the glider and push the airframe backwards so that the control frame unfolds until the rear wires are fully extended. (You did remember to undo the zipper before laying it flat last time, didn’t you?) Then attach the front wires to the nose catch and attach the heat shield (nose cone). Then turn it 100 degrees or so out of wind. Notice the red and white streamer. It is attached to the zip puller. That is insurance against forgetting to do up the under-surface zipper. 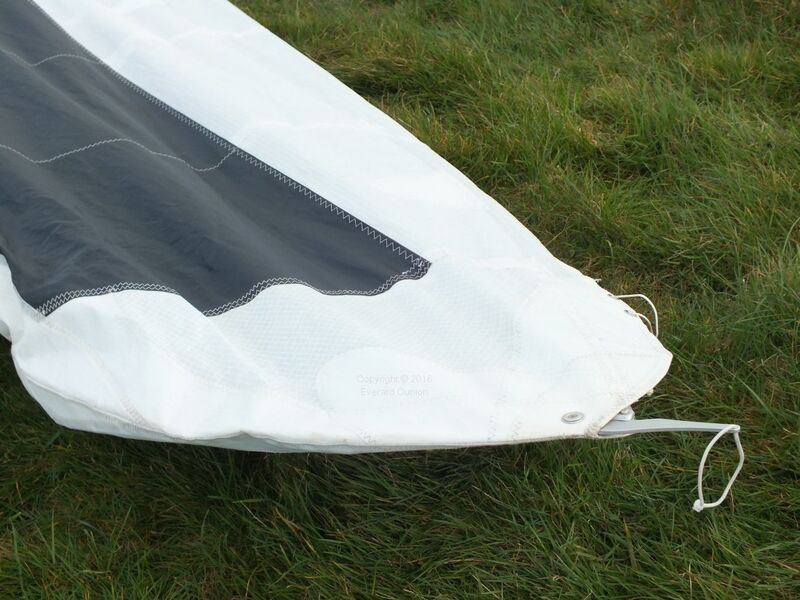 When the zip is done up, the streamer tucks away into the sail behind the control frame apex. Rig the dive struts (sprogs) and insert the under-surface battens. 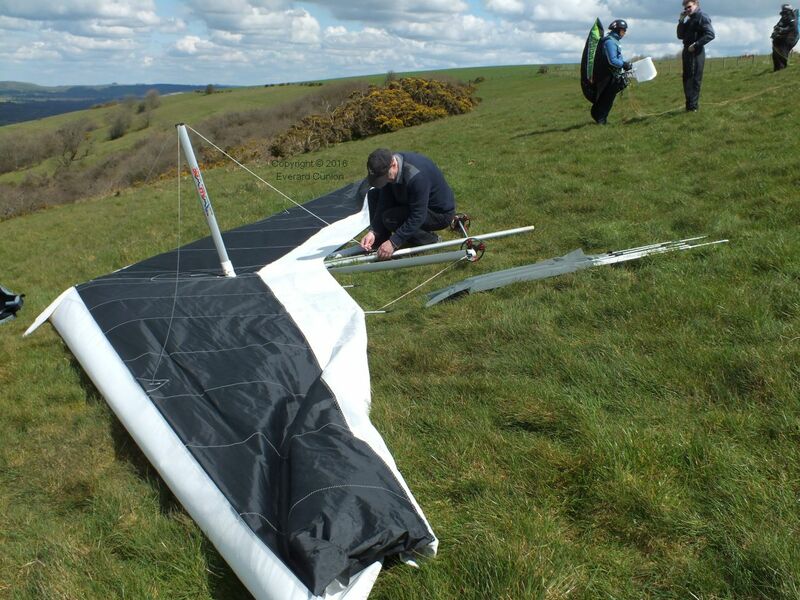 If you have rigged the undersurface flat on the ground, you then lift the wing up. Or rather, let the nose up a bit so the wind lifts the wing up, and attach the front wires. Check the VB system before closing the keel zipper. When checking the cross-tube junction and variable billow system, I do not let go of the VB cord when it is tight. It would not do to forget to let it off and take off with it fully tight. 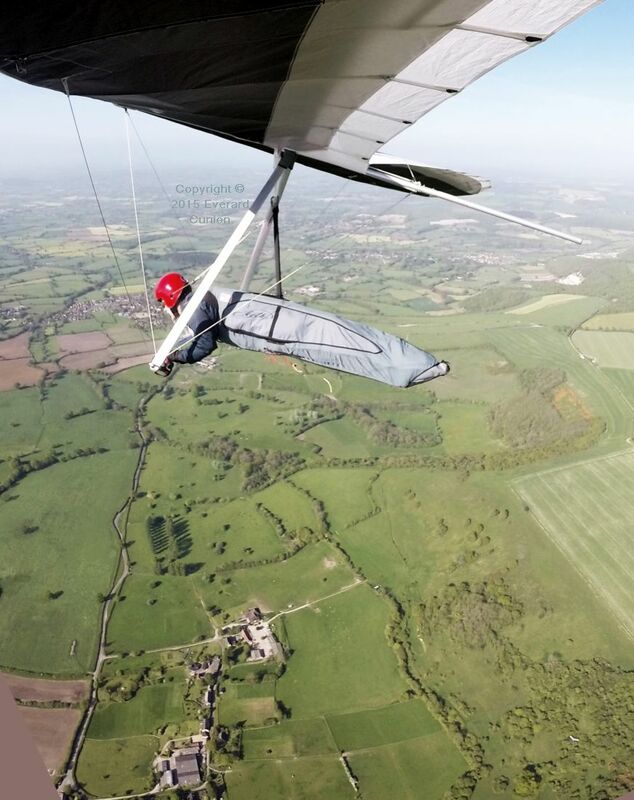 If you are going to leave the wing fully rigged cross-wind for some time, check the angle of the sun by looking at the shadow the glider casts. 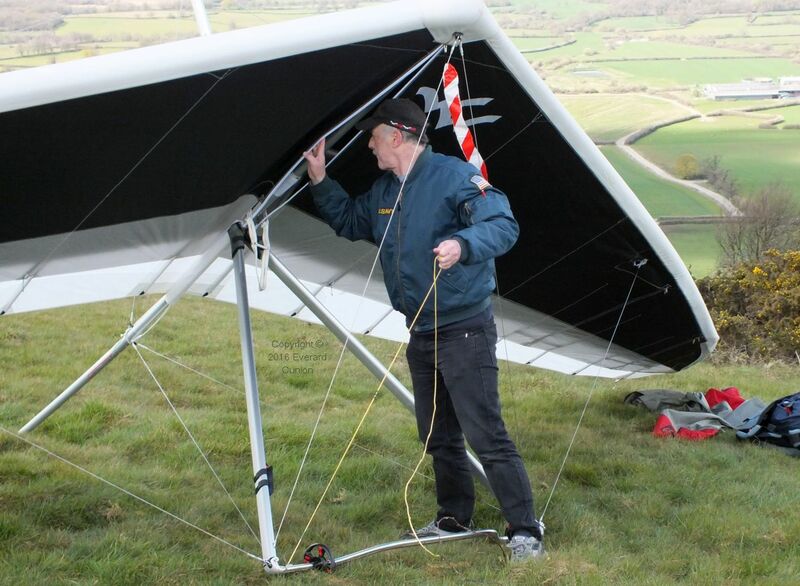 If possible, turn the glider so the sunlight impinges on it at a shallow angle to minimize degradation of the sail material caused by ultra violet. 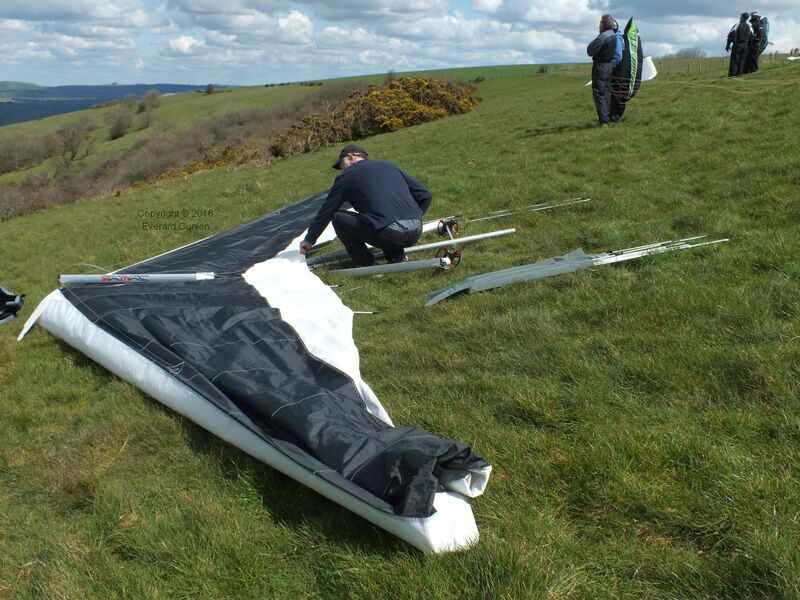 Die-hard Brits instead lay the glider flat when they are not flying. Lay your harness across the nose to keep the wind from getting under it and clip the carabiner to the front wire. 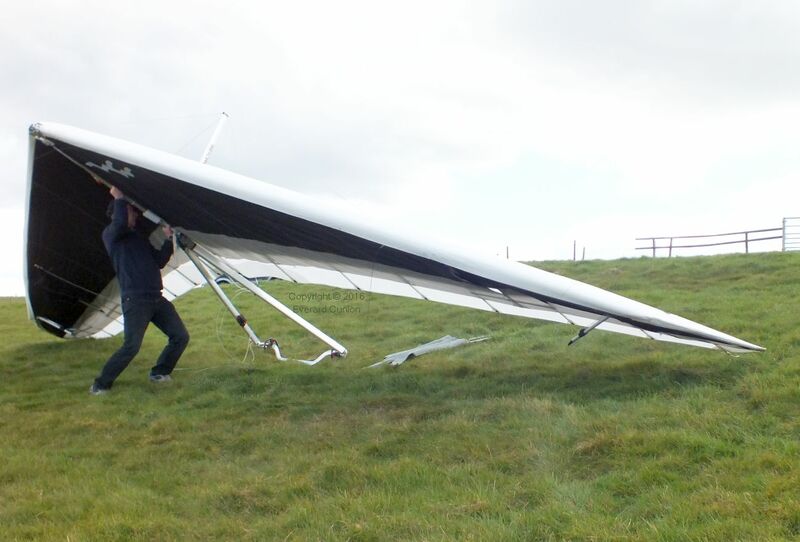 I have seen more than one wing get flipped up and pranged like that – fortunately without injuring a spectator. This photo includes my lightweight camera on a pole attached to the port outer dive strut (in case you wondered what it is). The U-2 zippers there are double-ended, which facilitates this kind of arrangement. 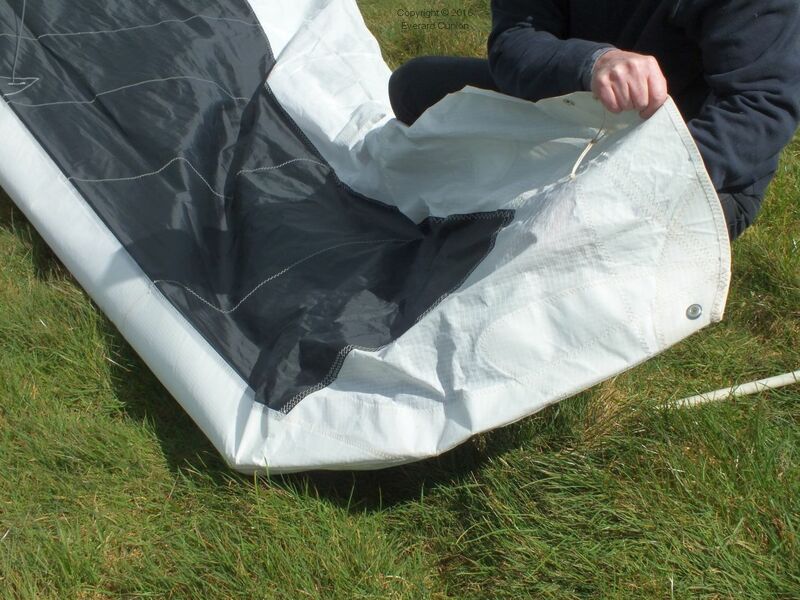 Tip: When de-rigging, as well as remembering to undo the keel zipper before you lay it flat, when you undo the dive struts and swing them out from inside the sail, do up their zippers a little way. 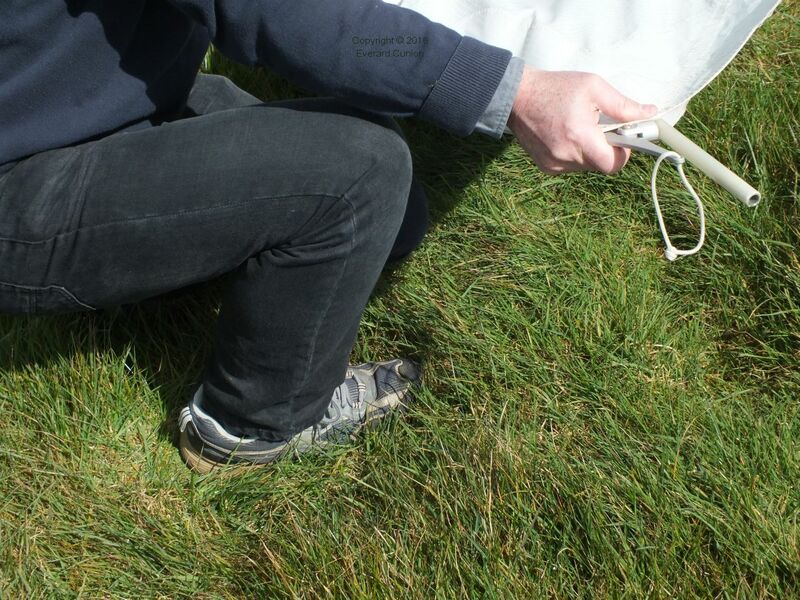 That prevents the struts from accidentally re-locating into the pockets and causing you much grief after you have de-tensioned the sail.